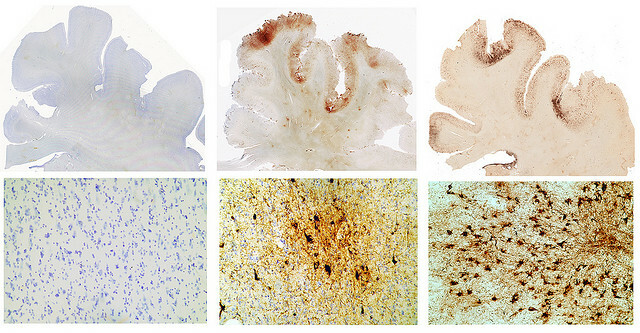 Chronic traumatic encephalopathy is a neurodegenerative disease that may affect amateur and professional athletes involved in high contact sports. It's also known as dementia pugilistica or "punch drunk". The term "punch drunk" came from observing signs of slowed/slurred speech, tremors, and confusion in boxers. Signs and symptoms may develop over the lifetime of a person through repetitive blows to the head that are thought to be cumulative. The question Doctors are researching now is how much can the brain take over a person's lifetime before CTE starts to develop, and if it is truly linked to repetitive trauma. Dr. Ann McKee describes what is chronic traumatic encephalopathy. There is currently no way to determine if a person has chronic traumatic encephalopathy while a person is still living. Diagnosis is made post-mortem by a neuropatholgist. Current work by Dr. Ann McKee out of the Boston University has been cutting edge in suggesting the link between head trauma like traumatic brain injury and CTE. Work done by Dr. Julian Bailes and Bennet Omalu out of Research Institute in West Virginia has also been instrumental in understanding CTE. The brown spots represent the tau protein tangles present in their brains. According to Dr. Ann McKee there have been 51 confirmed cases of CTE, 46 of which occurred in athletes. Boxing has the highest known occurance of CTE.